I love food, that’s no secret, and I’m a big guy, but it’s rare that eat until I’m sick (except for the holidays). I ate until bursting yesterday and today because of the two things we made. This is the first. 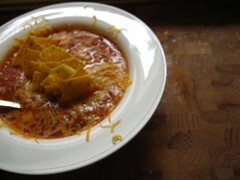 This Mexican Chicken Tortilla soup is amazing. Subtle spice, very Mexican, and Bridget shredded the chicken to make the consistency of the entire dish just perfect. We garnish it with sour cream (this is a photo of left-overs without sour cream because I wasn’t happy with any of my first photos), cheese and tortilla chips. 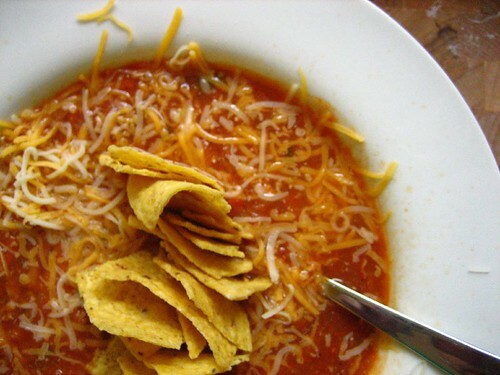 It’s soup, but eat enough of anything and you’ll get stuffed. Believe me, you won’t be able to get enough of this one. Okay, so tomorrow we’re posting an amazing dish (hint: lemons and mac & cheese).